Concept maps are a perfect method of visual presentation of ideas and concepts. This method was created in 60th of the last century by Professor J. Novak from Cornell University. Concept map is a diagram which visually presents links between some amount of main ideas or concepts. Each concept is presented in the diagram as a named object of arbitrary form. It can be rectangle, oval, circle or any other figure. Links are presented as arrows. These arrows can be lop-sided or two-forked. Also links can have names for clearing the concepts relationship. The main idea of the concept maps is that complex structures could be presented graphically and you will be able to see the picture as a whole. Moreover, you can illustrate concepts using pictures to ease the visual perception, that is very important in teaching or if you are using a concept map in presentation. It is necessary to define the difference of concept maps from «mind maps» more exactly. The concept maps were created first and the «mind maps» was developed as an evolution of this idea. According to the main «mind maps» ideologist T. Buzan, «mind map» is a diagram with one central idea and branches radiating out from it, which detail the central or main idea. A «mind map» focuses on one idea while a concept map examines a set of ideas and their relations. «Mind maps» are limited by one idea and corresponding radial or tree structure. Unlike the «mind maps» concept maps can represent complex concepts, which could require creation of different hierarchies for describable objects and defining of lots of intersecting links. Using concept map you can describe relations between several complex structures, while each of these structures can be described in separate «mind map». For creation of a concept map you can use the corresponding software. For example, ConceptDraw is a professional cross-platform software product for diagrams creating and technical drawing. ConceptDraw DIAGRAM diagramming and vector drawing software extended with Concept Maps Solution from the "Diagrams" Area is effective tool for creating professional looking Concept Maps. As concept map consists from conception-blocks and links between them, you can use ConceptDraw library objects and add to a document as much objects as you need. ConceptDraw tools let you to edit, group, move objects, change their appearance and add text signs and raster or vector pictures. As links between concepts you can use simple lines as well as «smart» ConceptDraw connectors. The convenience of using of connectors is that when you are moving an object, which presents a concept, the links between it and another objects will be automatically repainted. You can add text signs to the connectors and change their appearance – edit type and direction of arrows, lines type, their thickness and color. To prevent masses of text signs in complex maps you can use the dialog of object properties, which will show given information about the selected object. Another useful ConceptDraw ability is the possibility of programming objects for representation only the selected map part. Such objects will show conceptions linked to them only by mouse click. It is very convenient for work with big complex maps hard to examine, which consist of lots of conceptions and links. For example if your map was organized as a tree, you can program every object so representation of its sub-objects will happen only by mouse-click on this object. This property can be used in teaching process or during a presentation for step by step explanation of complex concepts. 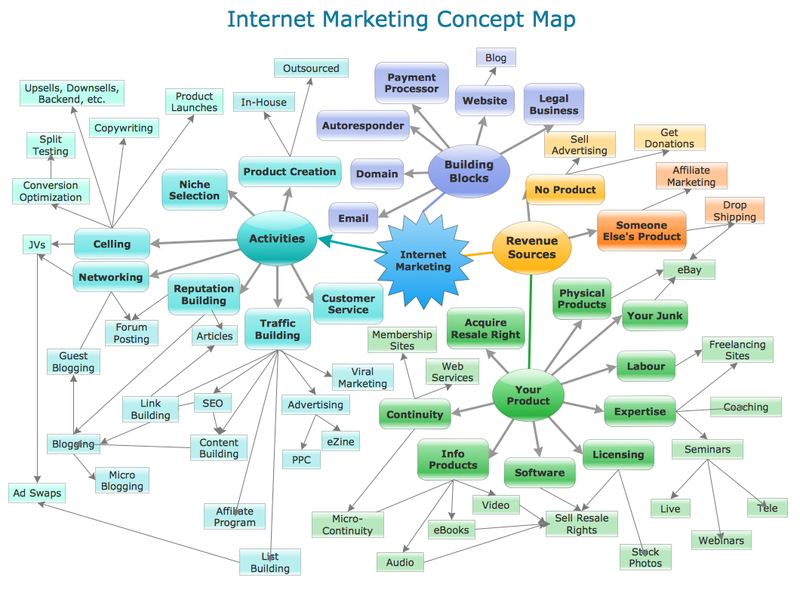 This Concept Map was created in ConceptDraw DIAGRAM using the tools of Concept Maps Solution for ConceptDraw Solution Park and illustrates the principles and components of internet marketing. An experienced user spent 15 minutes creating this sample. Use the Concept Maps Solution for ConceptDraw DIAGRAM software to create your own professional looking Concept Maps of any complexity quick, easy and effective. All source documents are vector graphic documents. They are available for reviewing, modifying, or converting to a variety of formats (PDF file, MS PowerPoint, MS Visio, and many other graphic formats) from the ConceptDraw STORE. The Concept Maps Solution is available for all ConceptDraw DIAGRAM or later users.